During this year’s Pacific National Exhibition some 60 horses where stabled next to the Agridome, representing the RCMP Musical Ride, the Pacific Coast Team Penning Association and an assembly of draft horses. As it usually happens among horse folk, chatter among the horse stalls slowly developed from admiration to teasing, to friendly competition. It seemed that a dare arose between the team penners and the RCMP as to how much skill it took to “cut out” 3 numbered cattle from a herd of 30 and corral them in a pen at the other end of the arena in 90 seconds. Typically in cattle penning when youth or guest riders are invited to ride, there is an experienced rider who makes up the third member of the team to act as a coach. On August 27th, Whitey Dropko of West Vancouver, a fourscore senior and 23-year penner, along with his 26-year old horse, was asked to be a third on the penning team along with two RCMP members. 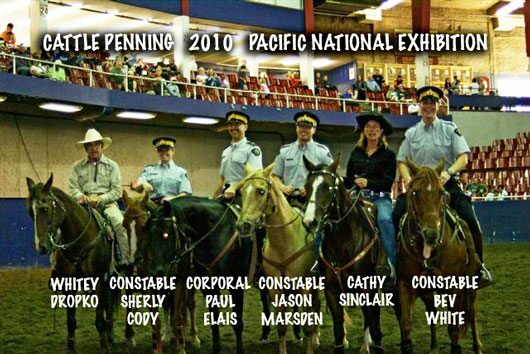 Cathy Sinclair, a very experienced penner from Langley BC, rode with two other RCMP members. With Stetsons and serges and shiny black horses safely tucked away so as not to get soiled before the musical ride, the RCMP and the penners entered the arena for a full-on, down and dirty penning competition. The first round found Whitey’s team the victors. This led to accusations of one of the RCMP members being a former western rider herself and thus a “ringer”, team-stacking etc., etc. Whereby, the teams were mixed once again and Whitey was placed with a two other RCMP members, again winning the round! Before the day was done, a team of Clydesdales entered the foray as well. As expected, great fun was had by all and I’m sure next year will bring some sort of rematch with lots of back slapping, hand shaking and camaraderie just as one would expect from those horse folks!